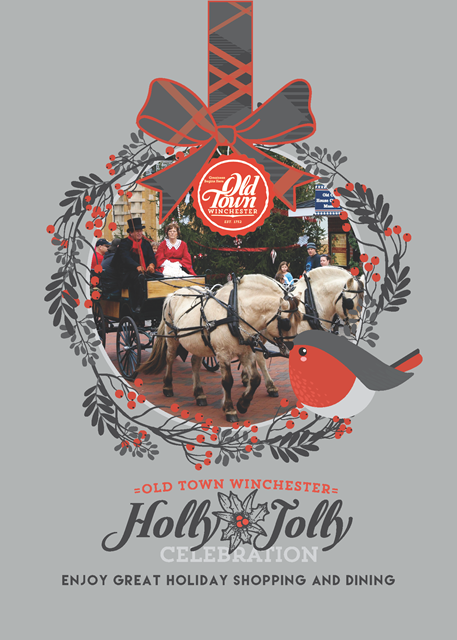 The Annual Holly Jolly Celebration is returning to Old Town Winchester in 2019 on December 14th! Details are coming soon, but until then see below for info on last year’s event. Come spend some time in Old Town this holiday season during our Holly Jolly Celebration on December 8th! Enjoy caroling and holiday activities including free holiday wagon rides from 1-3 p.m. Specials at shops and restaurants all day. New this year, from 11 a.m.-3 p.m. shop at the Holly Jolly Market for locally made decorative greenery, gourmet chocolates, natural health and beauty products, raw honey, and homemade baked goods. Sip on hot cocoa and enjoy warm frosted nuts while you shop! Children can create a holiday craft while waiting to meet Santa Claus at Santa’s Headquarters from 10 a.m. – 2 p.m. at the Godfrey Miller House (28 S. Loudoun Street). Enjoy holiday carols throughout Old Town Winchester provided by local choral groups. 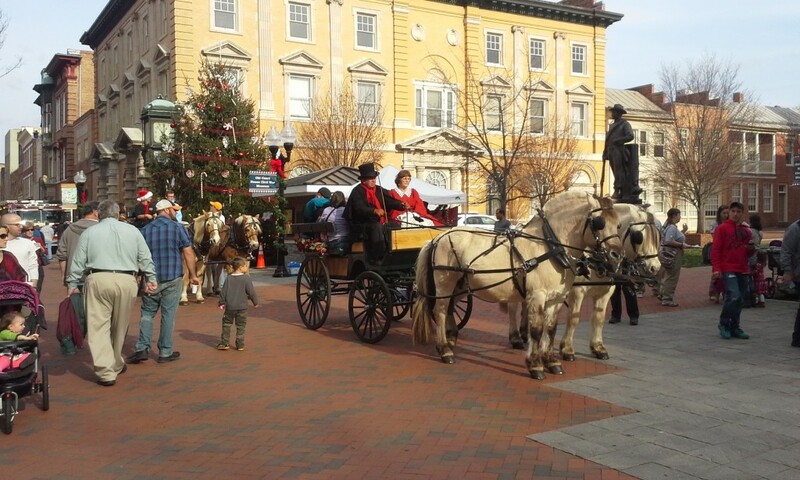 Free horse drawn wagon rides will be offered from 1-3 p.m. Meet in front of the Old Courthouse (20 N. Loudoun Street) to pick up a timed ticket beginning at 1pm. Tickets go fast! No need to stand in line! Enjoy holiday shopping and dining in Old Town and return to the wagon area prior to your ticket time. Families can visit Handley Library from 1-3 p.m. for classic holiday movies with popcorn as well as interactive stations and make-and-take crafts. Thank you to City of Winchester Parks & Recreation for assisting with Santa’s Headquarters! 10am-5pm – Caroling throughout the day. Groups include Sacred Heart Academy, Our Savior Lutheran Church, Abundant Life Church, and Christ Church Alleluia Singers. Boward Family Farm (Augusta, WV) – Body care products such as body butters, lip balms, sugar body scrubs, natural deodorant, tooth powder, skin salves, essential oil sprays and roll-ons. Canned jams, jellies, hot sauces, dried peppers, finishing salts, garlic. Handmade pack baskets from Ironwood Farms Basketry. Creative Concessions (Cross Junction, VA) – Hot cocoa and frosted nuts. Eby’s Baked Goods (Stephens City, VA) – Pumpkin rolls, pies, mixed cookie trays, fruit cakes, applesauce cakes, dinner rolls, breads, cookies, whoopie pies. R&E Chocolates (Strasburg, VA) – Artisanal truffles, chocolate covered cookies, chocolate lollipops, cake pops. Sycamore Creek Farm (Stephenson, VA) – Fresh made evergreen wreaths, garland and swags. Evergreen centerpieces. Fresh cut Christmas trees (variety of spruce, pine and fir). Homemade bows. Local apples, honey, jam and jelly. Assorted handmade country gifts including crochet hats and scarves, embroidery tea towels and pillow cases, crochet snowflake ornaments. 1pm-3pm – FREE Horse Drawn Wagon Rides. Meet in front of the Old Courthouse (20 N. Loudoun Street) to pick up a time ticket beginning at 1 p.m. Tickets go fast! No need to stand in line! Enjoy holiday shopping and dining in Old Town and return to the wagon area prior to your ticket time. Handworks Gallery, 150 N. Loudoun St. Receive a $10 gift certificate for every $50 spent during Holly Jolly. No limit! Kimberly’s/McKee’s, 135 N. Braddock St.
For every $150 purchase or more, mention “Holly Jolly” and receive a complimentary cashmere scarf. Wine tasting at the main store. Knit 1 Purl 2, 20 W. Boscawen St.
Murphy Beverage Company, 167 N. Loudoun St.
Wine Tasting and cookies, 2-5pm. Old Town Snow White Grill, 159 N. Loudoun St. Enjoy specials on hot chocolate, coffee, burgers, hot dogs, and fries during the event. Once Upon A Find, 48 S. Loudoun St.
Free pastry and hot beverage with every purchase. Receive a $5.00 Santa Buck for every $25.00 purchase. Free entry on the Santa Basket. The Polka Dot Pot, 157 N. Loudoun St.
Posh Pets Boutique, 156 N. Loudoun St.
Sale of 25% off all Christmas pet toys and 25% off all doggie iced Christmas cookies and gift sets. Saumaj Health Spa, 103 E. Piccadilly St.
Holiday Special of buy 4 gift certificates, get the 5th one FREE! No expiration and clients may use the hot tub and salt water pool, at time of service. Give the gift of beauty and relaxation, a memory in the beautiful George Washington Hotel. Scarpa Alta, 10 S. Loudoun St.
Shoe Sale! Select shoes and boots up to 50% off. Time Traveler Toys & Collectibles, 115 S. Loudoun St.
25-50% off ornaments, posters, Barbie, Star Wars, and other toys. Tin Top Art & Handmade, 130 N. Loudoun St.
20% off purchases of $25 or more. Valley Flag Company, 20 W. Boscawen St.
20% off all novelty flags. Wilkins’ ShoeCenter, 7 S. Loudoun St. Cast your vote in the Ugly Christmas Sweater Event! 9:30am-5pm. Join in the fun and wear your ugly Christmas sweater to receive 10% off! Exclusions apply. Winchester Book Gallery, 7 N. Loudoun St.
World of Healing/Fellowship of the Sip, 33 S. Loudoun St.